The Bethlehem Baptist Church west of Greenfield was organized May 17, 1942. About 10 people became charter members by the transfer of letter from other churches of like faith and order. The church covenant and Articles of Faith were read and adopted. 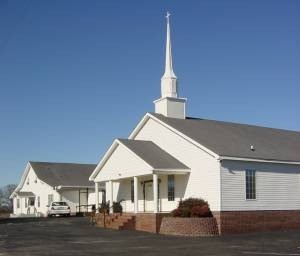 Sunday evening, September 20, 1942, the church met in conference and named the church Bethlehem Baptist Church. A petitionary letter to the Weakley County Baptist Association was written asking for membership. The first offering was taken for the Cooperative Program on October 4, 1942. The first pastor was Rev. W. E. Chadwick and was succeeded by Rev. A. W. Porter in 1943. The church then voted to have preaching each first Sunday afternoon and third Sunday night, beginning in December 1943. Land was donated by Mr. Paul Huffstetler and a new meeting house ‘40 X ‘32 was built at the present location and the first service held in the new building in June 1944. Wooden planks were set on concrete blocks for seats, and kerosene lamps were used for lighting. There was only a sub-floor in the building at this time. The church also observed the Lord’s Supper at this service. There have been at lease five major building programs through the years at Bethlehem, including the construction of a new, modern structure completed in 1991 that seats over 300. Since 1942, seventeen pastors have served the church with the longest tenure being that of Roy Auvenshine who served from March 1976 until his sudden death in December of 2007. Membership had grown to 486 in 2001.